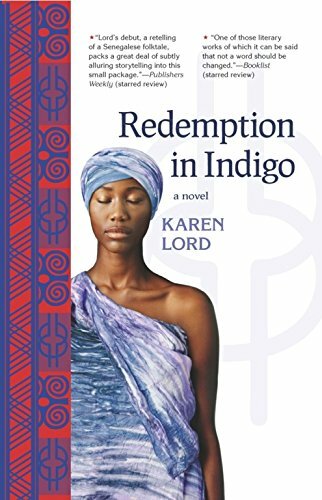 Redemption in Indigo, by Karen Lord. Redemption in indigo : a novel by Karen Lord. Easthampton, MA : [Minneapolis, Minn.] : Small Beer Press ; Distributed to the trade by Consortium, c2010. A beautifully-written and wise fantasy that addresses deep questions of good and evil. The setting is a village, possibly in Africa, where family responsibility remains strong and the “undying” interact with humans. The narrator is a Storyteller who frequently discusses the tale with his or her readers. The story, perhaps of Senegalese origin, starts slowly with a simple tale of Paami, the wife of a foolish glutton. She leaves him and returns to her village. When he comes to the village to claim her, she acts with strength and calm to save him from his own stupid behavior and sends him away. For her wise behavior she given the Chaos Stick, a magic tool for affecting probabilities which has been taken away from a spirit who was misusing it. From the there the story becomes complicated and involves a variety of magical creatures with varying levels of ability and good will toward humans. Lesser spirits do the will of stronger ones. Some of those who want to be helpful or only mischivious may change and become cruel and callous toward what they perceive as worthless humans. Taking the Chaos Sick, Paami, turns to the House of the Sisters for help and guidance as she tries to protect own sister from a strong, self-centered spirit who thinks it is the sister who holds the Chaos Stick which has been taken from him. Paami and the spirit engage in a series of adventures, and she stands up to his assumptions that he knows what is best for humans. She protests when he claims that allowing or causing pain and death in the present will result in future happiness. The sense of suspense and mystery about what is happening–and what is good–is central of the story. To tell more would lessen its power for other readers. Trust me and read this book. Karen Lord is originally from Barbados and has returned there to live. She has travelled widely and been involved in scientific research and teaching. The blurb says she writes fantasy to balance all the nonfictional writing she has done. Reading this book, such a background makes perfect sense. This is a story about balance and restraints, never about absolutes. I highly recommend this book as a gentle pleasure or as an exploration of always troubling human questions or, better, as both. ← Fantasy by People of Color: What is Different? This sounds like a really great read. I keep hearing little bits about it and meaning to pick it up, but for some reason haven’t yet. It’s definitely on my wish list now! Thanks to all of you. Yes, this is worth reading. I think Ellen Kushner said on Twitter that she LOVES this book, so that coupled with your review here really makes me want to read it. So sorry we didn’t get this linked up when you wanted – I added it to the schedule for today. Thanks for getting me in even late. that was great topic. A gentle pleasure sounds cool. And I’d deffo trust a rec by Ellen Kushner. I really really really want to read this book. I heard of it on twitter a few months ago from Ana. Ever since I’ve been impatient to read it. Coupled with your glowing reviews, I’m even more convinced. Good I think you will like it. Thanks. Glad to have you come by. Thanks. I am glad you have enjoyed my posts. They are pretty varied and I am not sure which of the subjects interests you. I also read a wide variety of other sites. You might just check out some of the bloggers who have commented on my articles or on my blogroll. I have started a challenge/reading group called Global Women of Color, that might interest you. Check out the page where people have signed up and left their proposed reading lists. I will be posting what we have reviewed there in a day or two. Be more specific about what you like and maybe I can be more helpful.